There’s bad news, as they say, and there’s good. The bad news is that we’re screwed in the Gulf, screwed in Afghanistan and screwed in all things economic. 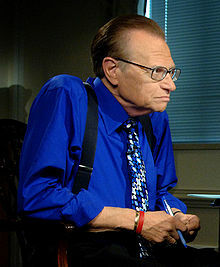 The good news: Larry King is finally calling it quits. Perhaps we’ve turned the corner. Yes, after 50 years that seems like 50,000 years, the skeletal old dude with the ludicrous suspenders has decided to spend more time with his wife and children. He’s 76. His eighth wife, 48, has just entered treatment for addiction to painkillers, not so long after Larry was accused of bedding her sister. His kids, 9 and 11, are wondering if this will mean less time with the Xbox. Should be some kind of relaxing retirement there, Larry. King is at pains to point out that he’s not leaving television, just his tedious show: “I’ll be doing specials. You’ll see me in other places.” Yes, OK. I would suggest a Christmas special with Andy Williams, but there’s the Jewish thing. In any case, I hope he doesn’t over-commit. The important thing is family. Good riddance. I listened to his radio talk show when it moved to afternoons until he got so inexcusably rude and abusive to callers who challenged him. And he frequently boasted that he never read the books of the authors he interviewed. WTF! Looks like you are on a roll, Knadler. Keep it up. See you in July.